1. It transfers energy from one circuit to another. 2. There are no moving parts. 3. There are no electrical connections between the two circuits. 4. It usually has two sides, the primary side and the secondary side. Typically, the primary is the side taking the power in and secondary is the side supplying the power to a load. 5. The most basic transformer consists of two coils on a single ferromagnetic core. 1. Copper Losses – Resistance of the wire. Phase relationship between the primary and secondary will either be in phase or 180 degrees out of phase. 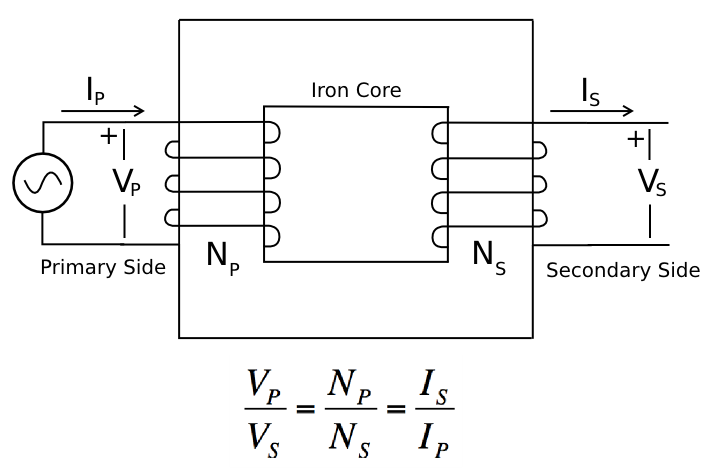 The above pictured transformer yields a secondary that is in phase with the primary. In order to tell what the phase relationship is use the right hand rule and if the North Pole generated by the right hand rule points around the core in the same direction then the two sides will be in phase. If it weren’t for the losses discussed above, the power in the primary would equal the power in the secondary or we say that the ideal transformer is 100% efficient. However, transformers aren’t ideal and they aren’t 100% efficient. Here is an example problem. If a 1000 Ohm resistor was placed across the secondary of a transformer with 500 turns (primary of 1000 turns) and a 200VAC source was placed across the primary winding, what is the current flowing in the primary if the transformer is 100% efficient? Because we know the turns ratio is 1000/500=2 then the secondary voltage is 1/2 times the primary voltage or 100Vac. Then because we have a 1000 ohm resistor across the secondary and a secondary voltage of 100Vac, using ohm’s law the secondary current is 0.1A. Finally, since the turns ratio is equal to the inverse ratio of the currents we have the primary current equal to 0.05A. Another Example… If a certain transformer is known to have 75W of input power and 70W of output power when a purely resistive load is applied, what is the operating efficiency of the transformer? 93.33% is the result when you divide 70/75. What is the turns ratio of a transformer if the primary has 100 turns and the secondary has 200 turns? If 120Vac was applied to the primary of a transformer with a turns ratio of 2 what is the voltage at the secondary assuming 100% efficiency? If 100Vac and 4A were measured at the secondary with 200Vac at the primary what is the primary current assuming 100% efficiency? If 200Vac and 8A were measured at the secondary with 800Vac at the primary what is the primary current assuming 80% efficiency? A 1000 Ohm resistor was placed across the secondary of a transformer and 500Vac was measured in the secondary. What is the efficiency of the transformer if the primary current 0.521A is and the primary voltage is 600Vac. A transformer has been measured to operate at 100% efficiency and has a turns ratio of 2.5. It was used to step down voltage from 480Vac to 192Vac but now you have found a use for a step up transformer and have decided to use this one backwards. You want to make sure it is working properly so you measure the new secondary current at 0.5A. What do you expect the new primary current to be?